The Working People’s Alliance (WPA) appears increasingly impatient at the way it is being treated by the People’s National Congress Reform (PNCR)-dominated A Partnership for National Unity (APNU), saying that it was no longer prepared to tolerate being bullied; a situation that Sunday prompted at least one executive member to float the idea of leaving the coalition. 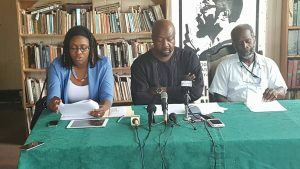 “After careful consideration of the WPA’s experiences – negative and positive – in the APNU, the coalition and government, I am convinced that the WPA, should as a matter of urgency, put on its political agenda, the issue as to whether it makes political sense to remain in the APNU coalition and government,” WPA Executive member, Tacuma Ogunseye said in a letter to the editor. Since coming to power in May 2015, the WPA has accused the David Granger-led APNU of holding very few executive meetings, removing Dr. Rupert Roopnaraine as Minister of Education without first engaging the party, sacking Professor David Hinds from a government job, and more recently removing him as a columnist for the State-owned Guyana Chronicle newspaper. The WPA has also expressed serious concerns about the manner in which government has closed down several sugar estates and placed thousands of workers on the breadline, without proper consultation at the grassroots level. PNCR Chairman, Basil Williams was not in a position to immediately respond to the concerns, saying that he needed more time to update himself. That party’s Vice Chairman, Dr. George Norton said issues such as that would have to be discussed internally before a collective decision is made. Taking a more cautious approach on WPA-coalition relations, Hinds said he would not like to see his booting from the position of a columnist for the Guyana Chronicle be used as the basis for withdrawing from the coalition-led administration. “I myself, personally, would not urge that this matter of my column become a source of discord within the coalition. I would urge strongly against that,” he said. Last Wednesday– one day after the Board of Directors by a one-seat majority upheld Editor-in-Chief, Nigel Williams’ decision to remove Professor Hinds and Lincoln Lewis as columnists– the WPA issued a stern warning that it would take action if it continues to be disrespected. “The frequency in which disrespect and unwarranted refusal to have prior consultation with the party leadership on matters germane to the party and to the nation, have now become a way of life which the WPA is no longer prepared to ignore. For the record, WPA wishes to make it clear that it will respond appropriately to this and any other acts of disrespect,” that party said. Hinds and Lewis have since decided to stop writing editorials for the Guyana Chronicle. Regarding the removal of the columnists as oppressive and dating back to previous dictatorships, the WPA vowed not to compromise on the right to freedom of expression of its members and hinted that it would prefer to leave the government. “For the WPA the right to free political expression is sacrosanct to the party’s political culture and will not be traded for political expediency or accommodation. We have never in the history of our party subjected any leader, activist or member who in their individual capacity choose to comment on matters of public interest, to censorship,” the WPA said. Ogunseye accused unnamed senior members of the Alliance For Change (AFC) and APNU of being behind the decision to remove Hinds and Lewis’ columns from the Chronicle. The WPA Overseas Associates, noting that the WPA has “stoutly” supported the APNU+AFC coalition but with no support in exchange, did not rule out dissociating itself from the coalition. “The WPAOA will only give support to those who respect the WPA and the democratic principles and political culture on which the party was founded and would reconsider its support for any organization that continues to disrespect its principles including support of the governing coalition,” the WPA said. Hinds and Ogunseye have since said the Guyana Chronicle Editor-in-Chief’s decision, being a politically sensitive one, could not have been taken without the approval of the political directorate. The scrapping of “Hinds Sight” and Lewis’ “Eye on Guyana”, Hinds declared, is a backward step in which the coalition would be hard-pressed to prove to the electorate at the next general elections that it was the alternative to the People’s Progressive Party Civic that was in power from 1992 to 2015. “I think it’s so backward because you could easily go to your own people and say to them ‘look, we are an alternative. Under the PPP, they did not have any dissent. Under our government, we have people who are supportive of us, who are critical of us writing in the State newspaper’; they can use that to their own benefit but I suppose our political culture is so myopic that they cannot see that so I think instances like these will add up and will work against them at the next election, God forbid that it does not work against them to the extent that they lose the next elections,” he said. Saying that he still supports the governing APNU+Alliance For Change coalition, Hinds echoed the position of his party that self-criticisms by supporters and uncensored criticism by the political optimism are healthy and should be tolerated in the State-owned media and not shut out by the government of the day. “I support the government and I have said that publicly all the time but I still reserve the right to be critical government on its policies and directions and decisions that it takes and I don’t see that as taking away my support for the government,” said Hinds , a United States-based Political Science Professor. He noted that it was ironic that the APNU+AFC coalition came to power in 2015, criticising the way the then People’s Progressive Party Civic administration had been dominating the State-owned media as the mouth-piece of the government. “It should reflect the views of all Guyanese,” he said. The WPA Executive member refuted Williams’ claims of re-branding the Chronicle because there is now no criticism of the government in the news and opinion-editorial pages since the removal of “Hinds Sight” and “Eye on Guyana”.